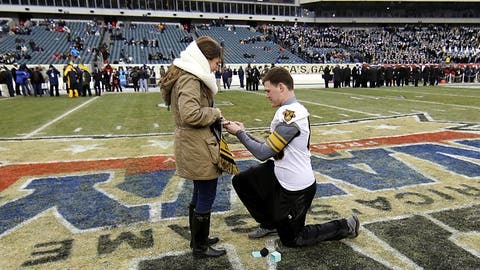 Army's Colin Joy proposes to his girlfriend, Nicole Veroline, on the field before the Army-Navy game. Injured Army offensive lineman Colin Joy will always remember Saturday’s Army-Navy game. And it will have nothing to do with the final score. The senior picked an amazing time to ask his girlfriend, Nicole Veroline, to marry him, as he dropped to a knee and popped the question at midfield before the start of the game.